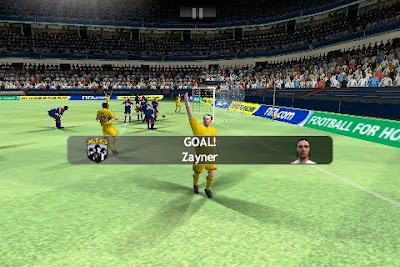 Someone sent a picture of me scoring on Fifa via twitter. I was very excited to say the least. I only scored once in college and do I foresee scoring in the MLS or pros, hmmmm, yeah maybe, but it may be some time. What if I do score? Ha I will freakin' freak out haha. I am gonna run over to our supporters section jump into their arms (picture this in a movie, slow motion) while I am getting doused with beer and hugs I will simply mouth out, again in slow mo, I-L-O-V-E-Y-O-U-G-U-Y-S...haha...and then run back on the field while replaying that moment for the next week in my pre-dreams before I actually fall asleep. Needless to say, do you think I ever want to score a goal...hmmmm. But, for now I will have to relish scoring on Fifa and looking like an old man. This year I will be careful not to shave my head like I did last year. Well, because they made me look 45 with a shaved head, I really do not think my receding hairline is that bad and I still think I look pretty young. But, according to Fifa I am on my way out I guess. Oh yeah and I was so excited to know that I went up about 8 points in the game. I am fist pumping in the air like a Jersey boy right now. So, for all of you who play me at forward or score or goal with me, I secretively love you in my heart. For right now I will settle with old man Jed from the Beverly Hillbillies scoring one for the giffer. And those are my memoirs haha. Great goal Jed....I played with u as well...however I ha vent scored yet haha but I know its coming! Dag man I could not defeat the "DagWood"